After all that Kentavious Caldwell-Pope has accomplished in his two years at Georgia, it’s a wonder that more people haven’t heard his name thrown around as a top prospect in the Draft class of 2013. 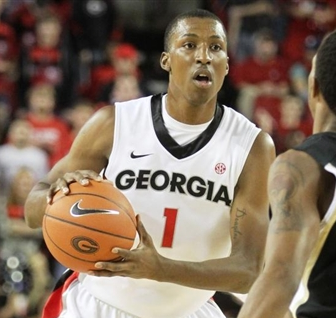 Caldwell-Pope (or KCP, as some are now referring to him as) has performed admirably for an otherwise less than stellar Bulldogs squad in his time in Athens, and yet isn’t being mentioned in the same sentence as Ben McLemore and/or Victor Oladipo. Caldwell-Pope was even named to the Coaches’ Freshman All-SEC Team last year, a squad that included the top three picks (Anthony Davis, Michael Kidd-Gilchrist, and Bradley Beal) in last year’s Draft. Caldwell-Pope is a great shooter; his 18.5 ppg can attest to that. Not only can KCP fill it up, but his shooting percentages were very good, as well as improved numbers from his freshman year (.43 FG%, .37 3PT%, and .80 FT%, as opposed to .40 FG%, .30 3PT%, and .65 FT%). Caldwell-Pope showed that he could adjust to the college game over time, and wouldn’t simply plateau, as some have done when returning for a sophomore year. Caldwell-Pope’s perimeter skills are very well rounded; he moves quickly off of screens, and puts up shots with great consistency. KCP is also good at bodying up his opposition while on the defensive end. He averaged 2.0 steals per contest, many of which came from jumping the passing lanes or sneaking up on unsuspecting opponents who weren’t taking care of the ball. Caldwell-Pope has some obvious strengths in his game, but he also has some glaring weaknesses that could cause him to drop down draft boards. KCP, while great on the perimeter, needs to improve on driving to the rim; he would sometimes put up insane shots (close to 30 feet) rather than trying to work the ball inside. If Caldwell-Pope plays a strictly perimeter game at the next level, teams will figure out how best to play him within minutes, and shut him down. Also, Caldwell-Pope’s defensive numbers –although good –won’t translate to the next level if he thinks that players will be so careless with the ball. He can’t rely on “sneak attack”-ing the opposition, and leaving his man open for otherwise easy passes that could turn into easy buckets. Caldwell-Pope is talented, and will most definitely hear his name called on Draft night. Depending on what kind of work he puts in on his driving skills and staying closer to his man on the defensive end, Caldwell-Pope could end up becoming a great steal in the draft. He’s shown that he can score and lead his team offensively, and he’s shown that he can play some defense; now is the time, though, for him to add those extra dimensions to his game. If KCP can do that, he could become a great player someday. This entry was posted in Home, NBA Draft and tagged 2013 NBA Draft, Anthony Davis, basketball, Bradley Beal, Georgia Bulldogs, Kentavious Caldwell-Pope, Michael Kidd-Gilchrist, NBA, NBA Draft, nba rookie, NBA Rookie Class, NBA rookies, SEC, sports by NBA Rookie Class. Bookmark the permalink.